I met Bobby Seith on the Dundee waterfront on a bright, gusty spring day, a dapper man with a broad smile and impeccable manners. To the Burnley faithful, he is known as ‘Bobby’, but to his family and friends, he is known as ‘Bob’ or ‘Rab’. 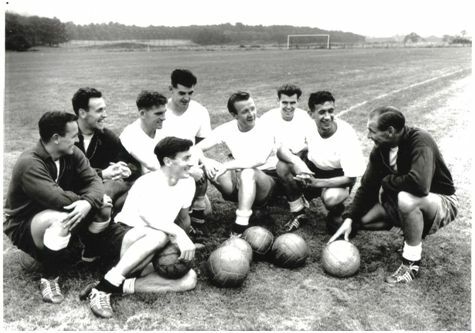 Bob made steady progress through the reserve sides, eventually graduating to the first team, replacing Jimmy Adamson at right half against Manchester United at Old Trafford on 3 October 1953. He was then aged 21 years having served two years national service in the RAF. As a member of the medical corps, he began training as a registered chiropodist. Having completed his training in the early sixties when he was awarded his professional accreditation, it would prove to be of vital importance. In the 1955/56 season, Bob Seith became a regular member of the senior Burnley side, playing 39 times at right half, replacing the injured Jimmy Adamson, and operating alongside centre half, Tommy Cummings, and left half Les Shannon. Upon Adamson’s return in February 1956, Brown asked Cummings, not Seith, to concede his place, moving Adamson to centre half and Cummings to right back. Bob scored his first goal for the club on 3 November 1956 against Luton Town. Deployed primarily as a defensive wing half he scored just six goals in 211 Division One League games for Burnley. He became almost a fixture at right half between 1956 and 1959. In reflecting upon this period, Bob said: “We had a lot of good players with the right blend of youth and experience. Just about all the players came up through the ranks. Only Jimmy McIlroy and Alex Elder were bought for comparatively small fees. Having played for so long together we developed a clear understanding about how we should play. We didn’t play to a specific system as such. It was very fluid. Our wingers would track back when necessary but what marked us out was our pace, mobility and skill, plus our cunning dead ball routines”. It all started to go wrong for Bob following a heavy defeat at Wolves at the end of March 1960. He made an error in the succeeding game, a 3-3 draw at home to Sheffield Wednesday. Bob was dropped for the following game at Nottingham Forest. He said: “I knew nothing about it until I read the evening paper. I think Harry should have told me first.” However, Bob added. “I had no problem with Burnley. They were generally very good to me. There’s no point going into why I left – it is water under the bridge”. Bob said that Colin McDonald’s injury in March 1959, which ended the Burnley and England goalkeeper’s career prematurely, was one of the most tragic losses he witnessed as a player. He commented: “Colin was such a good goalkeeper. He wasn’t spectacular. He didn’t need to be. His positioning was so good. He always appeared so strong and composed. He tried to get back after the injury, but it wouldn’t happen for him. Also, Bob Lord seemed keener to cash in the compensation. We did play together a few years later – in a charity game. By then he’d put on a few pounds and carried quite a paunch. After diving heavily to stop a shot, Colin joked ‘I could have rocked myself to sleep on this stomach of mine’’. “I didn’t get to see the final games of the Championship season. They didn’t play me in the reserves. I was not involved. But I did listen to the radio coverage from Maine Road. I was so pleased for my team mates. It was a great achievement. After the season ended, I came back to Dundee. During that summer of 1960 a friend suggested that I should approach ‘The Dark Blues’ about joining their training sessions, just to keep fit. 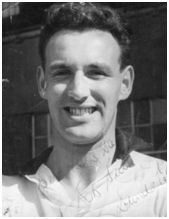 The Dundee manager, Bob Shankly (brother of Bill) agreed and after seeing me perform in a practice match, he told me that he wanted to sign me permanently. There was a snag here because Bob Lord had lined me up for a move to Stoke. I’m not sure what the connection was but Bob Lord seemed to be very close to Stoke – Jimmy McIlroy went there, so did Alex Elder and Doug Newlands. But I had no intention of going there. They were a second division side then. The Blackpool manager, Ron Suart, told me that he would have liked me to join them but said that Bob Lord wouldn’t hear of it. Dundee were not prepared to meet the asking price that Bob Lord had agreed with Stoke so there was a problem. I ended up talking with Bob Lord over the phone. I told him straight that I wouldn’t be pushed into a move to Stoke or Liverpool – another second division club who had offered a fee for me. If he wasn’t prepared to let me go to Dundee, I said I would leave football. In those days the club held your registration, so they could determine where and whether you played football. Anyway, I had another string to my bow. I had my chiropody qualification, so I thought I would turn to that if I couldn’t play professional football. He realised then that he wouldn’t get his way and let me go to Dundee for £7,500 but he wouldn’t let me have a Championship medal. I had to wait until 1999 to receive this”. Although Bob’s case received no publicity at the time, it was a very similar situation to that of George Eastham at Newcastle. Both players asserted their right to choose the club they wished to play for once their contracts with their existing club had concluded. Under the infamous ‘retain and transfer’ system the club holding the player’s professional footballer’s registration commonly believed it could determine where the individual would play, irrespective of whether there was a current contract in place. This was part of the ‘soccer slavery’ charge made by the Professional Footballers Association at the time. In both Bob’s and George’s case, the players simply told the clubs that held their registration: ‘’if you refuse to let me go to the club of my choice then I will seek alternative employment outside football’’. George Eastham found work at an Estate agent in Reigate. Bob continued: ‘Funnily enough, many years later some friends of ours bought Bob Lord’s former house. Sensing my possible unease when visiting them, they told me, ‘’It’s alright we’ve had the place exorcised.’ Bob’s unjust deprivation of a Championship medal was rectified after the writer Ian Ross uncovered this omission many years later. Once contact was made with the Professional Footballers’ Association and Burnley Chairman, Barry Kilby, Barry agreed to present him with one. Bob reflected: “As Jimmy McIlroy pointed out, it was worth the wait. While he and the rest of the team had their medals doled out by Bob Lord in the dressing room, I received mine in the middle of Turf Moor in front of 12,000 appreciative fans”. Bob received a fantastic ovation from the Burnley supporters as he walked around the pitch perimeter which clearly overwhelmed by him. It was a fitting way to right a longstanding wrong. In 1960/61 season, Bob played in the Dundee team that finished 10th in the league, behind local rivals United. At this point there seemed little prospect of ‘The Dark Blues’ emulating Burnley’s achievement but as Bob pointed out, it was a developing team with emerging stars like Alan Gilzean and Ian Ure. Like Burnley, Dundee grew its squad over a number of years combining youth with experience. They eventually won the Scottish League title in the 1961/62 season, breaking the dominance of the ‘Old Firm’. This allowed Bob Seith the opportunity to compete in the European Cup. ‘The Dark Blues’ performed brilliantly reaching the semi-final, where they lost to eventual winners A.C. Milan. Bob was deeply disappointed by the manner of their exit, believing that they had been nobbled by biased refereeing notably in the away leg in Milan. Had they progressed to the final they would have met the reigning European Cup Champions, Benfica, at Wembley! 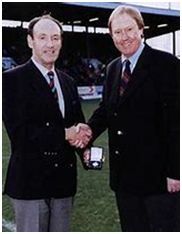 Kenneth Wolstenholme, the former BBC commentator rated Dundee as one of the best sides he had ever seen. In later years, Bob Crampsey of Scotsport fame, went further, insisting that Dundee were a better team than the great Celtic side that went on to win the European Cup in 1967. After finishing as a player, Bob joined the coaching staff at Dundee and later moved to Rangers in a similar role. Here, he worked under the legendary Scott Symon. One of his final contributions at Ibrox was to help re-focus Alex Ferguson who was incensed by Symon’s sacking in 1967. Bob said: “It must have worked because Alex went out and scored a hat trick.” Bob, too, was disillusioned with Rangers’ decision to remove Symon and consequently returned to Lancashire in 1968, to manage Preston North End. Bob found a once famous club in steep decline. True to his mentor, Alan Brown, Bob tried to instill good professional standards. Bob said: ‘I needed to be tight on discipline because the players had not grasped good habits. I remember laying the law down to a group of them, emphasising how important it was that they looked after themselves, if they were to make the most of their short careers. I knew full well how privileged I had been to be a professional footballer. However, I’m not sure that all of them cottoned on. I remember saying to them, ‘’For the brief time that you play this game you must be prepared to live like monks!’’. The casual attitude of some of the players irked me I recall a time when Archie Gemmill was on our bench. During the pre-match warm up he was shuffling around with his hands in the pockets of his tracksuit. I immediately asked the laundry staff to sew up the pockets of each player’s track suit. “I wouldn’t tolerate long hair, either. This didn’t go down well. Some players complained that George Best was allowed to have long hair, to which I replied, ‘’When you can play like him your hair can be as long as you like.’’ As tough as I needed to be, it must have had some positive impact. One of my signings was Willie Irvine, from Burnley who later remarked that though I was strict, I was always fair and well respected by the players. That’s nice to know.” Bob was right Willie Irvine speaks of Bob with great fondness and admiration in his book, ‘Together Again’. Preston continued to struggle, though, and in 1970 they were relegated to the Third Division, whereupon Bob left to become the manager of the Scottish national youth team. This role was short-lived though as he then went on to take charge of Hearts in November of that year. ‘The Maroons’ had endured several seasons of mediocrity prior to Bob’s appointment but gradually improved under his charge and in the 1973/74 season topped the League for several months following a 13-match unbeaten run. An inconsistent finish saw them narrowly miss out on European qualification though, and following a 10-game winless streak at the beginning of 1974/75, Bob resigned. He was considered a fine tactician, but the club was struggling financially, and he was not given the funds to strengthen the team. As Bob pointed out: “A manager can only be as good as the players he has working for him.” Bob continued his association with football for the next twenty years as a broadcaster with the BBC. After football, Bob was known and respected both as a chiropodist and a senior health service manager in Broughty Ferry, where he still lives. But as a long-standing ‘Dark Blues’ fan put it: “He will always be remembered as one of the lynch-pins who supplied the ammunition for the likes of Penman, Gilzean and others to strut their stuff and score the amazing goals that took this team to glory”’. For Clarets of a certain age he is fondly remembered as a fine defender, strong in the tackle and accurate with the pass. It is gratifying that he finally received his just reward for his fine contribution to Burnley’s Championship success in 1960. Bob made 211 senior League appearances and scored 6 goals.